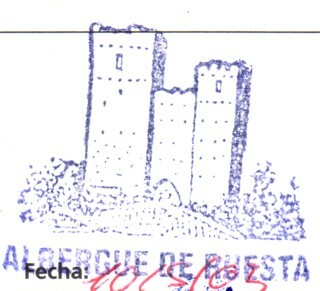 Well it´s been a long haul since I last wrote to everyone in Jaca. Later that day in Jaca I saw a procession connected with the fiesta going on there - people dressed up as soldiers but covering all periods from Roman to Philip II, so I`m not sure how that fitted in with defeating Los Moros, but I guess tat was just an excase for a celebration. As always with Spanish fiestas there were lots of bangers being let off well into the night and I have a suspicion there were fireworks, but I had long since gone to bed. And of course the Spanish can never go home quietly at 3 and 4 am! So it was a pleasure to reach a small quiet village the next day. When I set out I had expected to be using my Spanish, what I hadn´t expected was having to try and recall my French and even a few words of German. In fact French and Germans have been dominant so far and it´s surprising how many of them don´t speak any other languages, so I´m beginning to wonder if the English lack of foreign languages is exaggerated by all the other Europeans. The Finnish couple, who were very pleasant, of course spoke perfect English and a few other languages as well. I need to get some essential German vocab from my brother like - yesterday, today, tomorrow, I have come from..., I am going to...., where have you come from, where are you going to ? 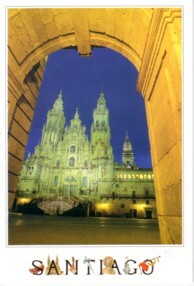 Are you going to Santiago? I can´t walk any further my feet hurt too much! Inevitably feet become something of a preoccupation - I thought walking 15 - 20 km would be no problem, but with a rucksack over rough tracks or in hot weather it seems interminable. I think my feet are at last getting accustomed to it (well that was wishful thinking I can say with hindsight!) and I´ve posted home the socks that were giving me blisters and padded out the bits of boots with sheep´s wool (off the fences and hedges) to stop the other bits hurting, so I´m hoping I might be able to start making more progress. Leaving Sa Cilia the Camino initially ran alongside the main road and here I saw my first wildlife other than birds - a fox bounced across a wheatfield looking a bit like Tigger and eventually disappeared into the woods that rose up the hillsides beyond the arable fields. 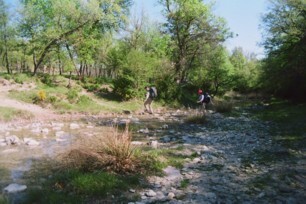 Close to Puente la Reina de Jaca the Camino diverged from the road and ran through some deciduous woodland over massive pebbles, presumably deposited during the last glaciation by the Rio Aragon (or its predecessor). 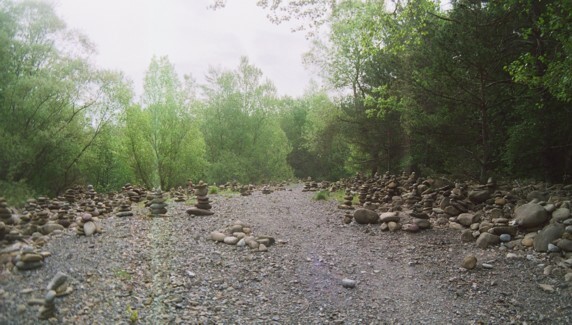 Pilgrims has constructed little cairns of the pebbles alongside the Camino. I was to discover such cairns throughout the Camino (an activity that, I would guess, was the traditional way of marking the route before the ubiquitous 'flechas amarillas' took over). Here the wonderfully rounded cobbles and pebbles had inspired a profusion of littles towers of stones, not matched again in such quantity in one place. Later, on the Camino a small pile of stones was often all important for finding the right track, when the yellow arrows had weathered away. 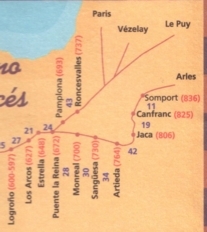 After Santa Cilia I decided to try and make it to the second hostel on the route 26 km away at Artieda as the first at Arres was only 9 or 10 km. Having started as a fairly cool day, it seemed silly to stop at midday. 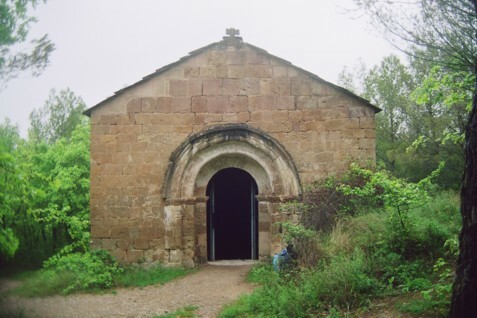 From Puente la Reina to Undues the camino follows a very isolated route with few villages, no shops, no bars and only the refugios providing food and shelter. Without villages there was no guarantee of water en route either. 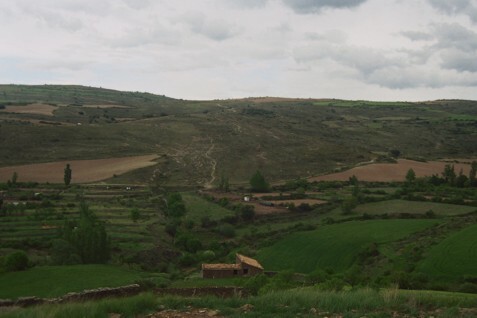 The camino followed minor roads from Puente la reina de J passed Arres and then onto farm tracks following a fairly level route along the valley with the hills rising fairly steeply to the south. Well it turned out to be a long hard slog, by about 2 pm it was really hot and I had a long siesta till about 4 before setting off again. It was still very hot, but then large black clouds started coming over the mountains to the south and the next moment the cloudburst started. Fortunately after hours of no habitation I was near a farm and the dueño gave me shelter from an incredible hailstorm and then insisted on driving me to the next albergue at Artieda. It felt a bit like cheating, but I had already walked 22 km and I think I might have had difficulty walking the last 4 km, so I regard it as an act of God! Artieda and the villages since Puente la Reina have all been hilltop settlements of stone houses, with a church (all with square towers round here) and often with romanesque features. From Artieda onwards there were no settlements till Undues apart from the albergue, which was 10 km both Artieda and Undues. Much of the terrain was not easy going, so I decided to just do the 10 km each day, which seemed to have helped get my feet used to the walking more. (Ten kms is considered nothing more than a Sunday afternoon stroll by most of the pilgrims!) After Artieda the day started cool, but gradually got hotter and more humid as seemed to be the pattern,and one reason I decided not go any further that day than Ruesta. I stayed at Artieda for breakfast, which they did not serve before 9 am (which is extraordinarily late for breakfast on the Camino) so I didn't set off till 9.30. The start was easy - after all it was down hill out of Artieda back into the valley initially following the tarmac road to Ruesta, which was fairly level. 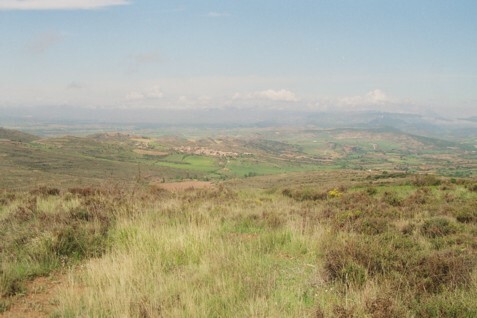 About half way the Camino diverged to run through oak woodland following a narrow footpath winding between the fields. A few kms before Ruesta it runs past a ruined ermita of sufficient historical interest that a cover (rather like a Dutch barn) has been constructed over it to protect it. 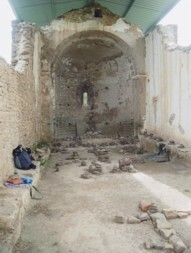 Most of the roof is missing and all the original internal features have been replaced by pilgrims stone cairns, crosses and posies of wild flowers. 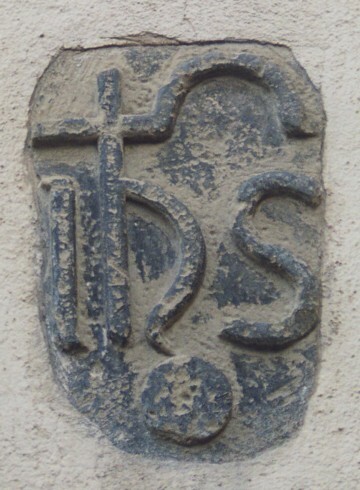 It becomes clear as one progresses along the camino that pilgrims need to leave their mark along the route, especially where someone else has first. 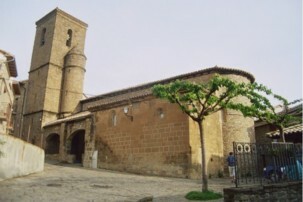 Artieda church, albergue and pilgrims to R. Ermita before Ruesta Ruesta castle and the abandoned village. From the ermita the Camino continued through the trees alongside the fields over a pebble strewn track (not easy walking) before rejoining the road and up the hill into Ruesta. I thought I had the track to myself when i heard some rustling in the undrgrowth or so I thought and stopped dead wondering if there were wild boar roaming round here - it was just another Spanish pilgrim rapidly approaching and overtaking me - he was highly amused to be mistaken for a wild boar. 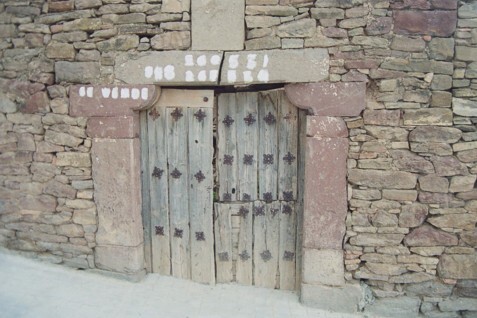 The village of Ruesta is completely deserted, abandoned in 1959 when the reservoir in the valley below was constructed and flooded all their agricultural land, so there was no means of support. 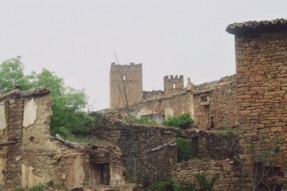 There were the remains of an impressive castle founded in the 10th C and originally Moorish I think, then Jewish and finally taken over by the Kings of Navarra. The cobbled streets disappear under the brambles and nettles so I couldn´t reach the castle (perhaps you have to be just the right prince arriving in 2059 to get through), but it looked impressive as I walked into the village. 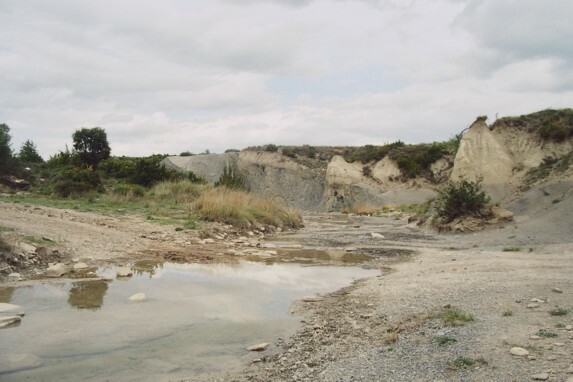 It's effectively a promontory fort defending the two river valleys of the rio Aragon, now flooded by the Yesa embalse and the rio ??. The place is now owned by a communist commune (of 3 it seems), who have renovated or rather very heavily restored two of the buildings for use as a pilgrims' and youth hostel. They provide meals and there´s a bar, but nothing else. 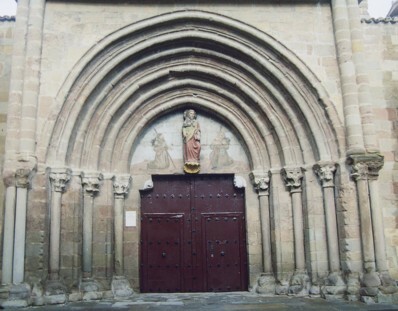 Ermita de Santiago, Ruesta. 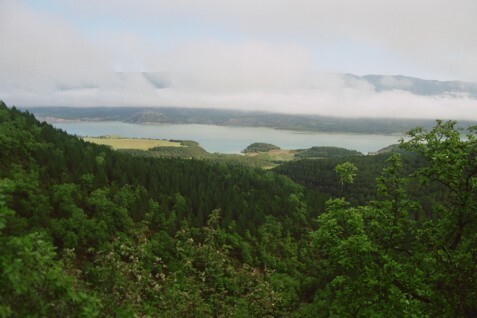 View of the Yesa reservoir from the sierra de Pena Musera After leaving the pine forests looking west towards Undues. This was another 9 am breakfast and a late start, but as I intended going no further than Undues it was not a problem. And when you leave Ruesta there there is nothing else for the next 12 kms as you treck up a forest covered mountainside of the Sierra de Peña Musera, which seems interminable with innumerable false crests, but in fact is about 5 or 6 km. It was foggy as I set off from the albergue following one of the cobbled streets down to the river, which the camino crosses and then starts to wind up the hill opposite initially along narrow footpaths, past the little stone romanesque ermita dedicated to Santiago, before following the main gravelled track between the conifer plantations. There were some spectacular views from the track down to the Yesa reservoir in the valley below. 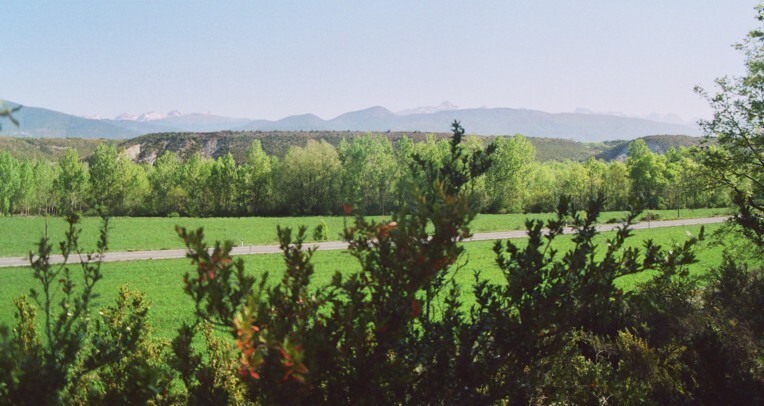 When I eventually reached the summit, the fog had long disappeared and the forests were now followed by a walk across more open country of wheatfields with the occasional barn or caseta suggesting civilisation was within reach, before eventually getting a view of the next village of Undues. This was much easier going only becoming a rougher footpath over bear rocks as the camino descended into the valley before Undues. 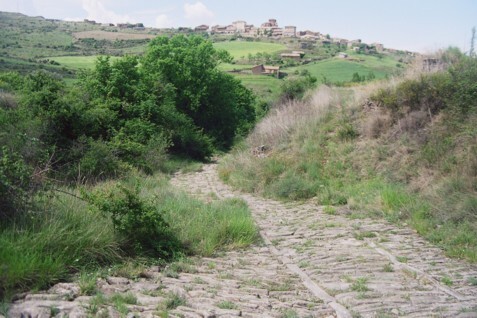 The last couple of kms on the approach to the village is on a Roman road with a few well preserved sections of cobbled surface, but much of it partially overgrown or damaged. The track rises up after crossing a small stream to reach the village on its hilltop. Below: door in Undues View of the Camino snaking down the hillside from the Sierra de Peña Musera Undues church and refugio. 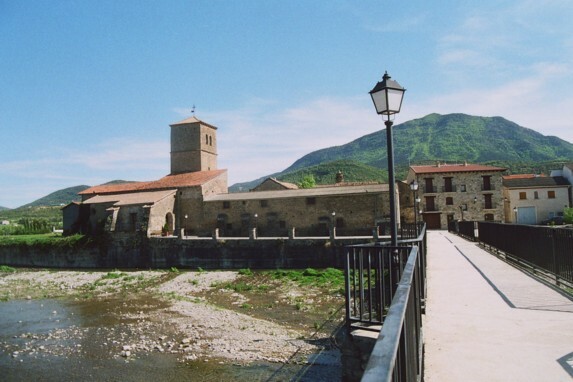 Undues de Lerda was another pretty little village (usual hilltop, stone buildings, impressive church etc.) and the guy in the bar, who also had charge of the hostel, was very friendly. It was also nice to have a bar open through the day so you weren´t strictly limited to the meal times as at the previous two places. 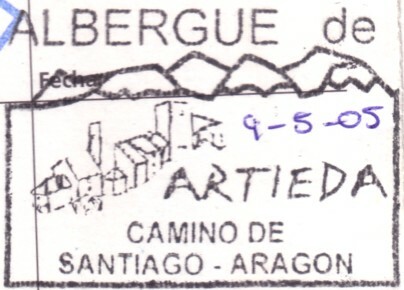 The albergue was in a renovated building in the main square and close to the church. The street surfaces were rather surreal, as though created by Dali, as they had all sorts of curving and undulating surfaces - I realised they were to take rainwater away from doorways, but it was a really curious effect. I was sharing a dormitory here with some German ladies (amongst others), whom I had first met at Artieda. I got on well with them and between us we managed to ensure that some fresh air circulated through the room at night both here and at Sanguesa. I was sorry to say goodbye to them when they finished at Sanguesa to return to Germany. One of the women though middle aged was very attractive - fair,tall, slim - and had made a real impression on the Spaniard, who had overtaken me before Ruesta. He left a message for her inviting her out to dinner in Pamplona before she left for Germany. Even though he had gone one to Sanguesa that day he took a taxi back to Undues so desperate was he to see her. But he was out of luck and she sent him on his way! The day started coll, cloudy and with misty rain. I set out earlier leaving about 8.15.The walk from there today to Sanguesa was straightforward and fairly easy - downhill, initially following a rocky path out of Undues though the start was very muddy after torrential rain last night, but subsequently well surfaced tracks for the most part over rolling countryside of wheat fields. The most exciting bit (and as it turned out the best mammal sighting on the Camino) was seeing a wild boar race across the fields, cross the road about 100 m in front of me and across the next field to a scrub covered hill (which I had rightly identified as archaeologically significant - it turned out to be an abandoned Medieval town of Ull dating to 14th-15th century), where I reckon the boar was living. The weather continued cloudy and dull throughout the day. I arrived before the albergue opened so found a bar for a bocadillo and left the sight-seeing until I could leave my rucksack. 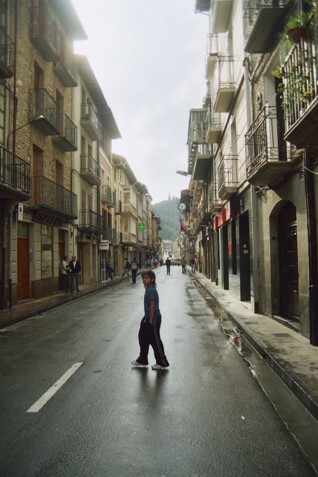 Well Sanguesa is down in the valley on the river Aragon and has people and shops and two internet cafes! The first one closed, so I´ve moved to this one which I think is about to close too so must finish. I didn't have time en route to describe Sanguesa, which lies in the valley just below the confluence of the rio Aragon and rio Irati. 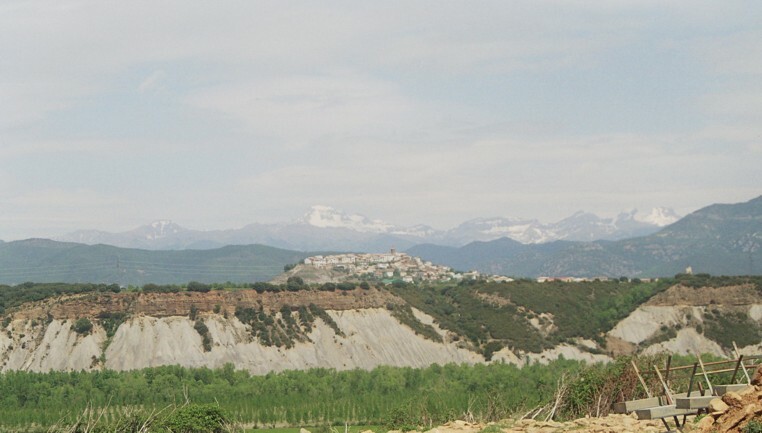 This was the largest town between jaca and Puente la Reina (Navarra). Between Undues and here I had left behind Aragon and was now in Navarra with bilingual street and place names in Spanish and Basque. 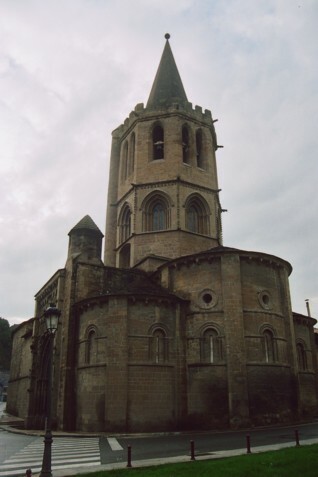 Sanguesa has at least three large churches, of which the most impressive is Santa Maria la Real - the entrance was I think the most intricate and ornate of the all the Romanesque architecture I saw on the Camino. Whilst trying to take a photo of thechurch I started to walk across what appeared to be an innocent piece of lawn, but turned out to be camouflaged quick-mud: as I started to sink up to my knees I worried that I would actually manage to free myself. The recent thunderstorms had turned the clay soil to liquid, but there was something hard below the mud probably demolished building rubble, so I managed to extract my flipflops off my feet and somehow get back to the pavement. I felt a bit stupid and was glad there was only one Spanish woman around to see the fiasco. I wash the worst of the mud off in some nearby puddles and crept back to the albergue to finish the job, hoping all the smart Spaniards starting to go out for the evneing paseo wouldn't look at my feet! 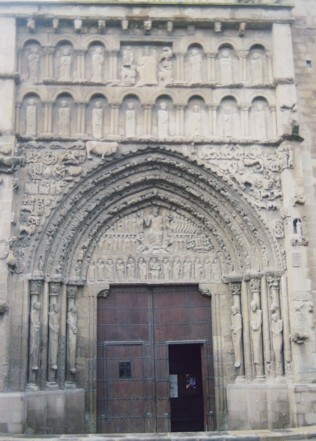 In addition to the churches there were isolated gates - the only remains of the town walls, an amazing building, the palacio de Villasantoro, which had the most incredible ornate baroque facade - it made Santa Maria look positively austere. Unfortunately because of the narrow streets it was impossible to photograph (and I didn't want to hang around with my muddy feet drawing atention to myself). In the Plaza Mayor there was another large stone palacio built onto the city walls (I think) with big crenellated towers at each end and now the public library. 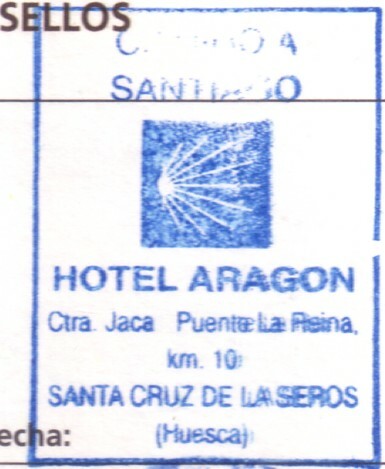 I joined the two German ladies (who must remain anonymous as cannot remember their names) for supper along with the German man, whom I had first seen in Jaca at the pilgrim's mass. The ladies assured me the rather eccentric man was not typically German (far too jovial and talkative or something I think). 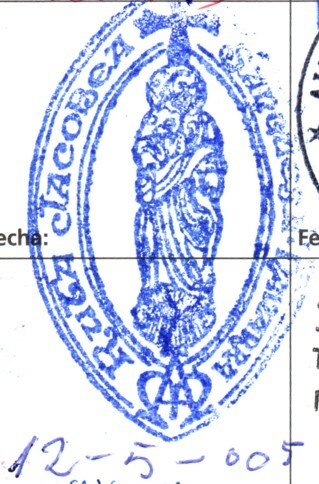 I saw him off and on along the Camino, finally losing him somewhere round Ponferrada I think. Also staying at the albergue here was the mad Frenchman Axel. He was planning on walking along the main road the next day as he reckoned all the tracks would be impossibly muddy after all the rain. 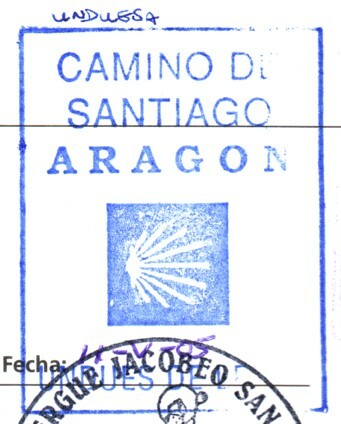 From Sanguesa the Camino divides and there are two choices other than the main road. The more genuine is by Rocaforte, but as this means a stiff climb shortly after leaving Sanguesa followed by about 15 kms of uninhabited mountain and forest, I decided to wimp out and take the alternative route via Lumbier.